Develop, and never give up. wow, nice. But I have one question that can I generate qr code with different color combinations? Sure.Hit me. I'm also new here. I'll help you, I've been here for over 1 year, but I forgot most about SmileBASIC. If Facebook, Myspace, Twitter, Instagram, and Snapchat were all destroyed, 90% of teens would go insane. If you're one of the 10% that would be laughing at them, copy & paste this into your signature and hope it happens. Wait was that just a joke? how do u post qr codes here? This is a background mapping program called "MAPIT" that uses GRP file format. It holds 8 maps, layer 0 and 1, along with a trigger map. To save a map draw background, press start, go to maps. Wait for the blue line, press A to upload your map to the top screen where the blue line is. Press start again to store map. Go to backgrounds and select Save Background. To load background Go to background menu, load background, make sure to visit maps to store maps into program. On maps you can press B to download map to bottom screen or A to upload bottom screen to top. If you need any help just ask. A program to read the map for a RPG has not been written. Note the backgrounds are stored in two color groups (big endian). The first color is the upper part of the number and the sencond number is the lower part of the number. Also added to the color is a 0 or 1 in the hundreds place for horizontal and vertical flipping of the tile so make sure to take this off in your rpg program. The action or event map is used to store wall locations, actions that may happen on particular ttiles, or whatever you design your program to do. Hello guys! Sorry I haven't been on here in a while. I am working on a game called "Prender Men", and I hope to be able to post it before February of 2015.
demonstrating gosub return points are not remembered after using exec? Not gonna post the actual QR codes here, but a link to them. 243 QR codes for - Megaman 2 PTC. Version 1.0.1 of MM2PTC is up. It contains bug fixes and uses the Megaman 2 font. 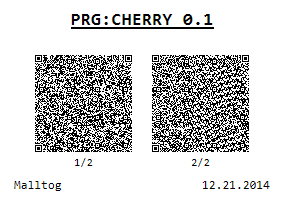 If you have already scanned v1.0, then you only need to rescan the PRG codes. There is one minor bug fix in the GRPs that is not mandatory (fixes a name for one sfx in the Audio Player), but not scanning in the GRPs won't affect anything. Be aware, if you rescan even one of the new GRPs from the new list, then you must rescan them all. 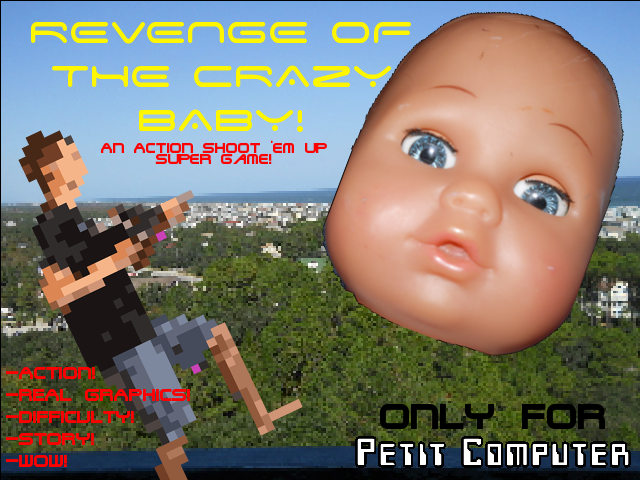 I updated Revenge of the Crazy Baby, so have the new QR codes! 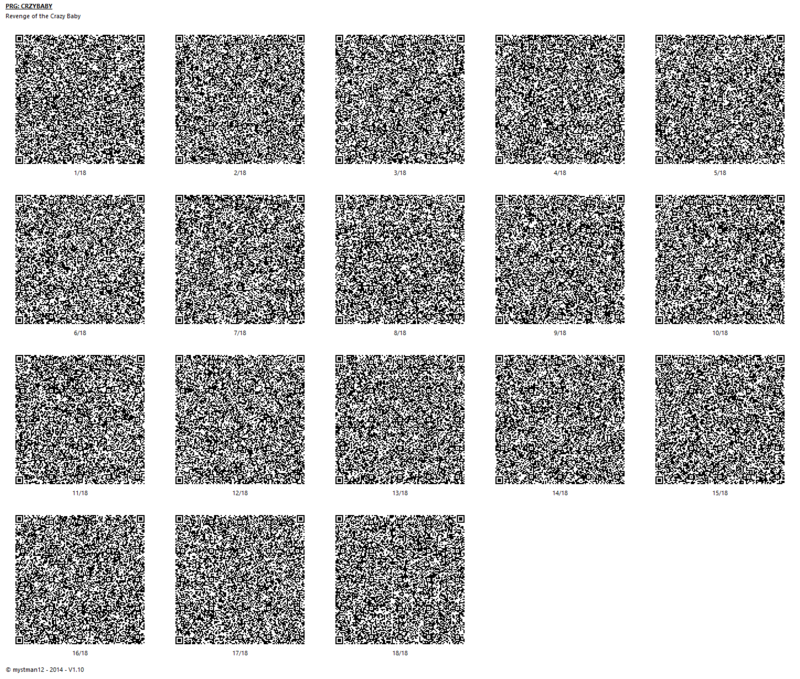 Program FACEIT used to draw faces for RPG games in 40 x 40 pixel groups. Use Dpad to upload image to top screen and change to new face location. You draw on the bottom screen the face. Move using Dpad to the next face. Save to GRP file the top screen. EDIT: Locate command was causing errors in the load and save commands. I removed the Locate command and update the qr code. I have returned! Does anyone remember me? I made Carrot OS a while back (page 78), but I lost the QR codes and it's been so long since I've worked on it that I decided to make a new program entirely instead of trying to re-understand Carrot. So, behold! Cherry OS version 0.1, with another name that starts with C, contains two Rs and two vowels and is six letters long! This 0.1 has a lot less features than Carrot OS 0.1 because this time I'm posting earlier in development. It took me about a day to write the code and also re-familiarize myself with SmileBASIC. Please let me know if there are any bugs, or if you have a suggestion for an application. However, since this is the QR thread, please send feedback to the main Petit Computer thread, if you don't mind. Make sure to mention me, please, or I probably won't even hear/see/notice/read/use it. Thank you, everyone, for all the valued feedback! I took all of it into account in making Cherry OS 0.2! ...okay, I lied. There wasn't any feedback. BUT I made another version anyway! Added Settings, now with customizable colors. Cherry OS 0.3 is now finished!